Michele's Little World: Dial $65K Gold Giveaway! 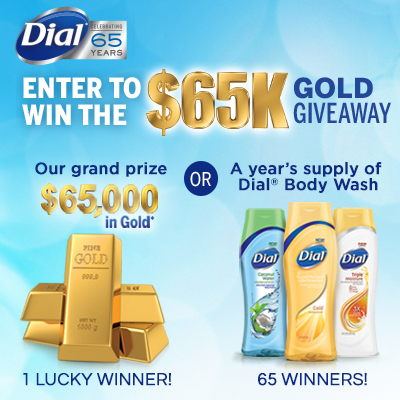 To commemorate the Dial brand's 65th Anniversary, Dial is giving away $65,000 in Gold to one SUPER lucky winner! 65 winners will also be chosen to receive a year's supply of Dial body wash. Participants may enter once per day on Facebook. You will also be able to share this sweepstakes through social media sites to receive an exclusive Dial Coupon. I couldn't pass this contest up. Have you thought about what can be done with $65,000?! Imagine the opportunities presented to you with this amount of cash. Remember to enter EVERY day until August 19, 2013. I never get tired of the deliciously scented array of body wash offered by Dial. In fact, my entire family has found a scent they enjoy. Dial products are available in women's, men's, children's, and gender neutral products. One of my favorite scents available is Dial Yogurt Vanilla Honey Nourishing body wash. The sweet scent of vanilla and honey definitely heightens my senses. As you can see in the photograph, my family loves Dial! I was going to take a photo of the Dial bar soap to share. However, this post is focused more on body wash.
Watch the Sunday newspaper for coupons. Dial periodically publishes coupons for consumers to utilize. If you search your local stores for a sale, you can end up with a fantastic bargain! I was able to pick up a few of these products for as low as $1 with coupons depending on the sale available. Dial is affordable even without a coupon. Prefer bar soap? I discovered multi-packs of Dial bar soap at the local Dollar stores! Yes, I grabbed a few packs as well. **Disclosure: Dial has provided me with coupons for sharing this post. I have randomly selected individuals to receive a coupon for a FREE Dial body wash. All opinions are my own and unbiased.